Now, you can significantly increase the productivity of your workforce with the performance based pay system described in Warehouse Productivity. Warehouse Productivity provides detailed plans for implementing a Simplified Gainsharing approach to improve — even double — workforce productivity. This section explains the principles behind Simplified Gainsharing, and details how to get started in your facility. Key sections include how to overcome objections and get employee buy-in, improve both productivity and quality, set performance expectations, and more. Simplified Gainsharing impacts both hourly workers and their supervisors. This section focuses on the changing role of the supervisor or frontline manager and shows how to keep these key players motivated and focused so that they can continue to drive greater productivity gains throughout the warehouse. Once your Gainsharing program is established you’ll find that productivity is up, turnover is down, and quality and morale are both soaring. But there are still productivity gains to be made. In this section the authors explain how to implement and run a mentoring program that will ensure that each warehouse worker is operating at peak productivity. 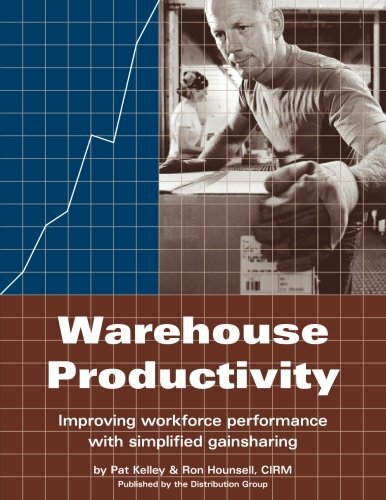 The only book of its kind, Warehouse Productivity offers real-world examples of how to apply the principles and strategies outlined as well as overcome some of the inevitable stumbling blocks. And, because this is a real working manual, it also includes a wide range of sample documents to help you implement the program. These include: Metrics and Baselines, a sample Simplified GainSharing Plan document, the Supervisors’ Checklist, a GainShare to Free Time poster, the Mentoring Plan document, Brainstorming Techniques and the Characteristics of a Good Corporate Program Sponsor. If you’re ready to see quality and productivity soar while reducing your warehouse staff to a core of top-flight workers, you’re ready for Warehouse Productivity. Warehouse Productivity was written by Pat Kelley, Director of Logistics for True Value Hardware where he has seven DCs reporting directly to him, and dotted line responsibility for another six DCs in the True Value network; and by Ron Hounsell, Director, Logistics Services at Denver-based Cadre Technologies, a leading innovator of fulfillment systems used by logistics service providers, distributors, and manufacturers. Together they created, refined and implemented Simplified Gainsharing programs at distribution centers across the country. They have shared their experiences with managers at industry meetings run by CLM, WERC and others. Now, they have gathered their best experience and insights in this book to help you increase your warehouse productivity.